Condomi began producing condoms in 1996 that conformed to the European standard EN 600. This particular standard is very important because condoms that do not conform to this standard cannot be sold in the EU. The standard seeks to ensure quality, and without quality and reliability, a condom is not going to protect against disease and unwanted pregnancy. Plus all Condomi condoms are free of animal derivatives and meet or surpass all global and domestic quality accreditations. Even if you or your partner is a vegan, you can have the protection you want at a price you want to pay. 12 x Condomi UltraThin – The Condomi Ultra-Thin Condom is strikingly sheer at only 0.05 mm thick. With a seven inch length and width of 52 mm, it fits most men like a second skin. Made from transparent high quality natural rubber latex, all of these condoms are British kite and CE quality marked. 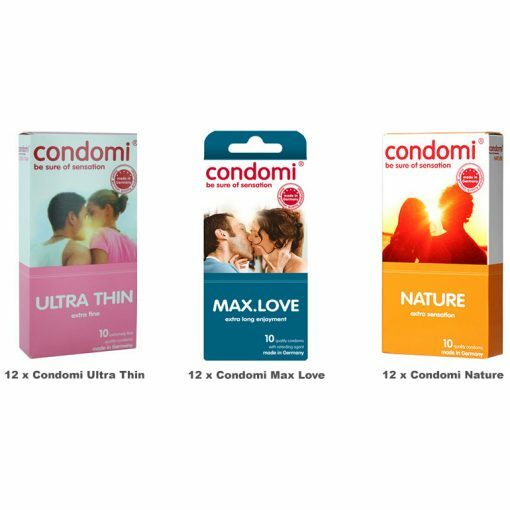 12 x Condomi Max Love – Condomi Max Love is a biodegradable and vegan approved latex sheath with a delay lubricant that offers a performance enhancing experience. These have straight sides, a teat end and are coated with a delay effect lubricant. 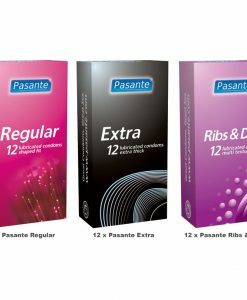 12 x Condomi Nature – This basic condom is very popularly priced which allows consumers to buy a quality product without having to give up genuine sensitivity and pleasure. Each condom is transparent and made from high quality natural rubber latex. The gentle lubricant does not contain spermicides.